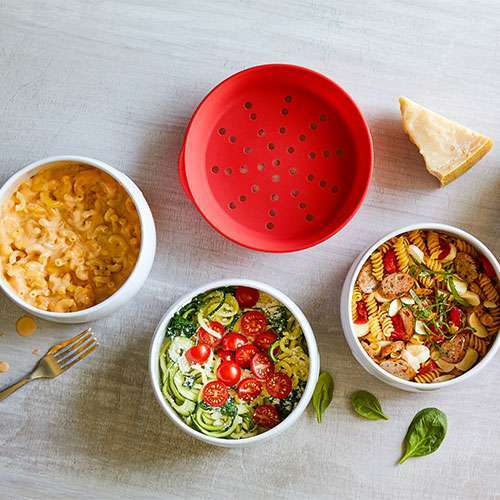 I love Pampered Chef’s Microwave Pasta Cooker. One reason I love it is that I live with a finicky eater. I love my wife, but she never quite knows what she wants to eat. So this is perfect for those nights when she doesn’t want what I had planned on or had already made. I can whip together a single serving of a pasta or grain or veggie in about 10 minutes. That aside there are some features I appreciate. For example, the silicone lid has vent holes, which let steam and water escape. This means there is no water boiling over in the microwave. This means one less thing for me to clean. The silicone lid also works as a strainer when I need it to, so I do not have to dirty my stainless-steel colanders unnecessarily. Plus, everything is dishwasher safe. The Microwave Pasta Cooker reminds me of some of my more challenging days Sometimes we all have days where life triggers us and we need safe ways of venting without making a mess. We each need spaces and people in our lives who are our vent holes. They are the ones we go to when the pressure of life is overwhelming and we need to drain off of us that which we no longer need. Another feature is that the ceramic dish can go from the microwave to the table, so there’s only one dish to wash. When you have a busy life, anything that can save you time cooking, serving, and cleaning is helpful. It also fits perfectly in our Microwave Bowl Cozy Set, but that is a story for another time. Well maybe not – lol. You can put the Microwave Pasta Cooker inside the Microwave Bowl Cozy. This was you do not need an extra hot pad or pot holder. I love that I can just pull it out of the microwave and not have to worry about burning my hands. I use the two together so often that I forget that they are two items and not one. A friend of mine and I were talking about sacred writings recently and I asked her what her two favorite writings were. She said the Bible and another book. I had to remind her that the Bible was a collection of smaller writings. She was so use to using them all together, that she had stopped thinking about them as separate. Sometimes practices like praying and journaling, or prayer and meditation go together so seamlessly that we forget they, like the Microwave Pasta Cooker and Microwave Bowl Cozy set, are separate items.